Last week — last Thursday, I think? 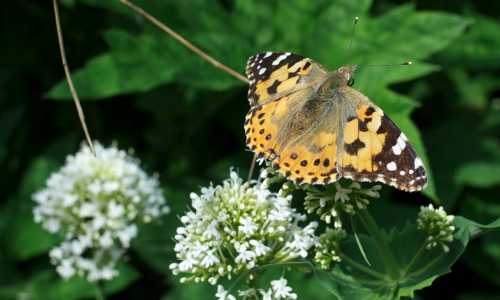 — I was walking along the road and saw a butterfly go past which I thought was maybe a Painted Lady. Not actually my first of the year, because I’d only recently returned from Provence where I saw *thousands* of ’em, but still quite pleasing because they’re a migrant species resident in North Africa, and while they are not actually a rarity in Britain — some turn up every year — they’re not especially common either. In fact over the past week we’ve been in the middle of a massive movement of painted ladies across the whole country. Apparently it’s because they had good weather for thistles in Morocco over the winter. It probably isn’t a coincidence that I saw quite so many of them in Provence; I didn’t think that much of it at the time, since they’re a more common species in the Mediterranean, but there were an awful lot there. Maybe some of them were the same ones that are now fluttering across England. It hasn’t been particularly obvious that they’ve been migrating in my garden; there are a few flowers they like and so I’ve been seeing them fluttering back and forth, in no apparent hurry to get anywhere. But while it might appear to be the same three butterflies going round and round in circles, I guess it has probably been a whole sequence of new ones. Today, after a couple of days of rain when I guess all the butterflies have been sensibly laying low, I saw one fly past outside the window, so I went along to the local park. And sure enough, there they were. Not in their thousands, but a regular stream of them passing through, looking much more determined, flying more or less straight by, heading about NNW. One every few minutes rather than one every few seconds, but once you knew what you were looking for, it was still quite striking. Reported occasionally from Iceland, which has no indigenous butterflies. I bet a few will make it to Iceland this year. 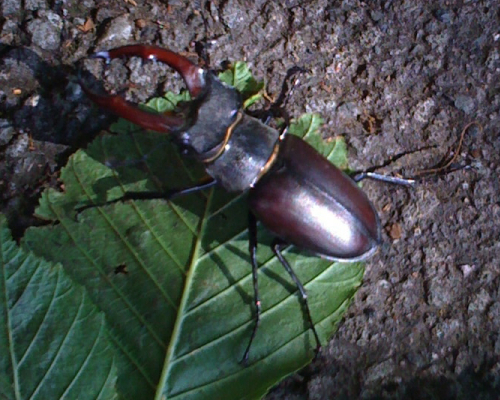 That’s a Stag Beetle. There are many species of stag beetle worldwide, so to be exact it’s Lucanus cervus, but in the UK it’s just Stag Beetle because we only have the one species with proper antlers. There is also, to be pedantic, the lesser stag beetle, but that’s much less interesting. South London isn’t exactly a wildlife stronghold for many species, but stag beetles are increasingly rare nationally and doing pretty well around here, so it’s good to see one. It’s also good to see them because they are just fabulous little beasties. While I’m on insects, a few things from Provence. We saw lots of butterflies, most of then just too hard (or too much work) to identify: blues, fritillaries, either Pale or Berger’s Clouded Yellow and so on. But also Swallowtail, Scarce Swallowtail, Red Admiral, Brimstone, Orange Tip. And this, the Southern White Admiral; another iPhone picture but it has come out looking surprisingly good. Most of the time they didn’t actually look that blue, but the light was obviously catching it just right. Now maybe you know what that is, but it confused the hell out of me. It looks most like a dragonfly, sort of, and it flies rather like a dragonfly, but the head isn’t right and look at those antennae! They were almost enough to make me think it was some kind of weird clearwing moth or even weirder butterfly — but it just doesn’t look right for either. 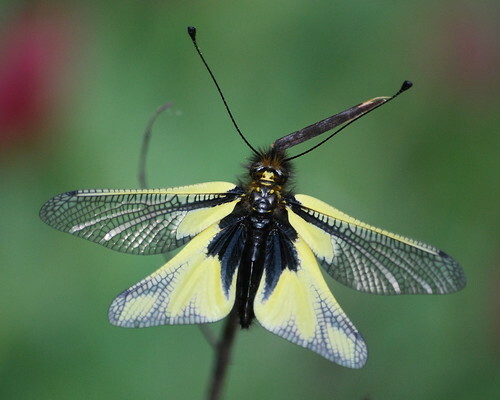 Thankfully for the sake of my sanity, my mother’s superior Google skills came to the rescue when we got back: it is an owlfly. A what? I’d never heard of them. They are related, Wikipedia informs me, to the lacewings and antlions, something which is not at all apparent when you see them sitting with their wings spread like dragonflies, but which makes more sense when you occasionally see one with its wings folded. » All the pictures except the last were taken by me. The last is Libelloides coccajus, uploaded to Flickr by and © Le pot-ager (Philippe Vannier).